Jamecia was born and raised in New Orleans, Louisiana and it’s kind of hard for her to get with the personalities of these Norther Louisiana folks, especially Jacob. The fact that she came to Shreveport to better her life, is what makes her put up with the people but she’ll be a fool to let them get over. Maybe, that’s why every chance she gets she squeezing Jacob out of money. He’s a smart mouth, arrogant, and a white boy which only makes matters worse. Jacob loves all things woman and he doesn’t discriminate or care if she’s black, white, or brown; she just has to be pretty. However, in all his life, he’s never ran into a beautiful woman that he didn’t like until he met Jamecia. She is mean and down right hateful if you asked him, and on top of that, she knows how to make a person pay. Will these two continue to bump heads or will the fighting lead them to Everlasting Love? 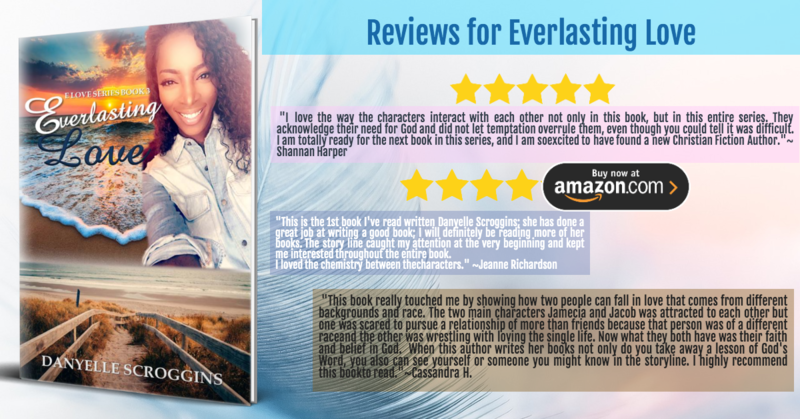 Buy Your Paperback Copy Here! Jamecia moved to the back and pulled every shoebox to the front of the closet. When she had gathered all of the boxes, she crawled out and started-one by one-placing the boxes on the dresser. Regina had entirely too many shoes, but Jamecia promised to help her pack as long as she could take whatever she wanted. Sure, she’d rather be hanging bulbs on a Christmas tree, but the reward for cleaning the closet brought greater satisfaction. She stacked eight boxes of Coach shoes to the side, along with four pairs of red bottoms she absolutely adored. One thing for sure, Regina had style and great taste, and Jamecia did not mind hand-me-downs. Especially coming from a lady with as much class as Regina. Not only did she adore her, but their entire family. Regina was cool, and after all she’d gone through, she was undoubtedly a woman of faith who was worthy of double honor. She could hear Regina moving around in the living room, and every now and then she’d stop working, to make sure she heard no signs of distress. Regina was now walking, but that didn’t stop Nathan or for that matter, even her, from being cautious of her. After things sounded calm, she went back into the closet to gather more items. Regina got up slowly from her recliner and walked into the kitchen. She’d only been at home for two days and dreadfully missed the Stallone’s family home. She stayed there eight months after the wreck and had enjoyed every moment. The only consolation prize was having Jamecia staying with her. Therapy had been both joy and pain, causing her to fight hard to regain her full range of motions. Although she still limped, she was thankful she could walk. Nathan was too.